I was nearly ready to push “submit” on this one when from across the crowded coffee shop I hear one adult talking to another about kids and technology, and how sad it is that today’s kids are so, “tweaked out on the internet”. I couldn’t hear every word, much to my eavesdropping chagrin, but they went on to say that kids used to be allowed to ride their bikes around town and “wouldn’t that be nice”. YES, it would, but is technology the problem? My family and I attended “Rethinking Everything”, an Unschooling Conference, where I had the pleasure of hearing Peter Gray speak. 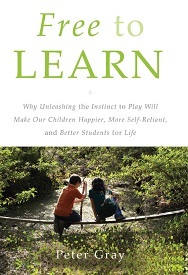 Afterward I immediately ordered his new book, Free to Learn: Why Unleashing the Instinct to Play Will Make Our Children Happier, More Self-Reliant, and Better Students for Life (there’s that word ‘Unleashing’ again!). I was intrigued by what Dr. Gray, who is an Evolutionary Developmental Psychologist and research professor at Boston College, had to say about the decline of play since the middle of the last century, and the resulting detrimental effects on children’s development and learning. Three chapters in Dr. Gray’s book are focused on children’s play, and they are packed full of research findings and specific examples of how multiple forms of play benefit children, so I thought I’d point out five of my favorite quotes. In case you’re worried, this isn’t that movie preview thing where all the best scenes are in the trailer! I had to narrow down my list of great quotes from 19 quotes that dealt directly with the concept of play. 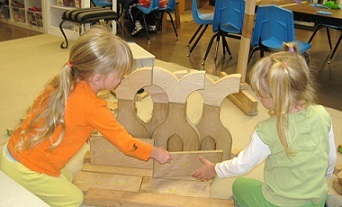 I really enjoyed thinking about many of the Ed Psych theories I have long been familiar with through the lens of play! What is play, then? To frame the chosen quotes I begin by sharing Gray’s operational definition of play (p. 140). 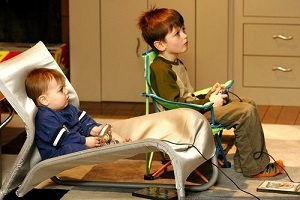 (1) Play is self-chosen and self-directed; (2) play is activity in which means are more valued than ends, (3) play has structure or rules that are not dictated by physical necessity, but emanate from the minds of the players; (4) play is imaginative, non-literal, mentally removed in some way from “real” or “serious” life; and (5) play involves an active, alert, but non-stressed frame of mind. It is important to note that Gray himself generated this list from the previous work of philosophers and researchers such as Johan Huizinga and Lev Vygotsky, who he acknowledges in the references. I thought I’d also share the quote that relates most closely to my own work thus far as an Educational Psychologist, you know, in case you were wondering what I’ve helped contribute to the topic! Okay, so I snuck in a few more than 5, hope you enjoyed! Want more on Play? Read Dr. Gray’s book, or this NPR article on schools that ARE keeping recess (although its focus on organized recess activities was somewhat disappointing).